AUGUSTA - The Maine Department of Agriculture, Conservation and Forestry's (DACF) Maine Forest Service is working on an Emergency Order to Stop Movement of Ash in response to the detection of emerald ash borer (EAB) in Frenchville and Madawaska in Aroostook County. The Emergency Order will be issued within the next two weeks, but additional feedback is welcomed and encouraged. 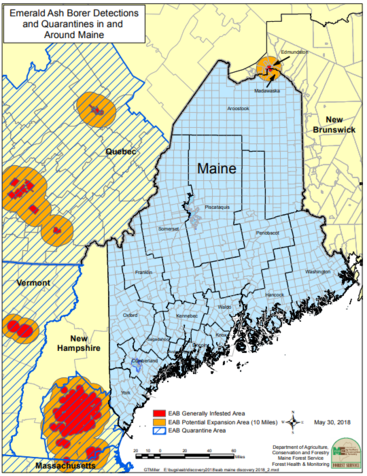 The Department held a public meeting in Frenchville on June 18 to provide information to the businesses, residents and towns immediately affected by the discovery of EAB in Maine. A letter to attendees and stakeholders summarizing what has occurred since the meeting has been issued. The DACF has posted preliminary FAQs regarding the order on its emerald ash borer website. The Emergency Order will likely be issued by early August; feedback is sought by July 25th, 2018. Discussions of parallel state and federal quarantines are expected soon, perhaps after the Emergency Order is in place. There will be additional and more formal periods for public input during the process of setting up federal quarantines.